Quick Links »» Synopsis | Procedure | Results | Previous Surveys | Graphics | Report Cards | Questions/Comments? The State Water Resources Control Board (Water Board), in collaboration with the Department of Water Resources (DWR), presents the final 2015 Municipal Wastewater Recycling Survey results. 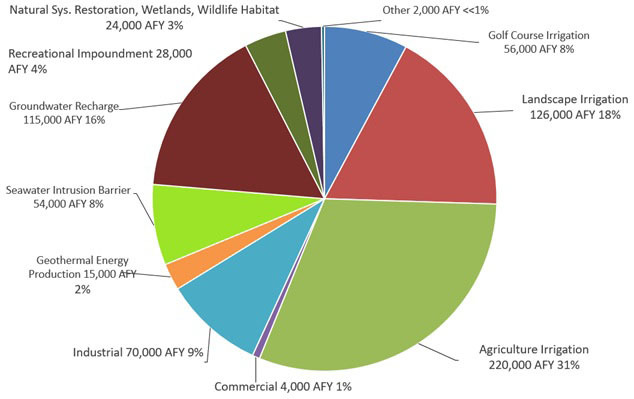 A total of 714,000 acre-feet1 per year (AFY) of Title 22 compliant recycled water was used for various beneficial reuses. Table 1 and Figure 1 summarize the statewide recycled water use for calendar year 2015 for each beneficial reuse. *One acre-foot of water is enough water to cover one acre under one foot of water, or enough water to cover a football field (including the end zones) in about 9 inches of water, and is enough to provide sufficient water for two average California families of 4 for about a year. As the survey was conducted during the California drought and water use conservation measures were in place, residential per capita water use was about 86 gallons per capita per day (R-GPCD). Scroll over bullet points for more information. Table 2 below provides a comparison by beneficial reuse and notes the changes between the 2009 and 2015 water recycling surveys. The survey was conducted by contacting water and wastewater agencies by email and direct phone calls. Responders provided their information by completing data forms through an online web portal, by phone, or by email. Information was collected about where recycled water was obtained, where it was distributed, and its uses. In cases where a recycled water system involved multiple agencies in the treatment, wholesale and retail distribution to an end user, every effort was made to avoid duplication. Additionally, in-plant process use, such as pump seals and tank washing in a wastewater treatment plant, was considered part of treatment plant operations and was not included as recycled water. Only Title 22 compliant treated municipal wastewater, originating in whole or in part from a domestic source and directly used for beneficial reuse was counted. An important distinction made during collection of the survey data was disposal versus reuse. Every wastewater facility in the State of California disposes of its wastewater after it has been treated to the requirements established by each facility's permit. If the recycled water was used to irrigate a crop, park, or rangeland upon which cattle grazed, then it was considered to be beneficially reused and was included in the survey data. If the recycled water is put into disposal ponds that are not permitted for groundwater recharge, released into an adjacent river, or dispersed on a spray field without any crop harvest or pasturing, then the recycled water was considered to be disposed and was not included in the survey data. This survey focused only on intentional reuse - where recycled water was delivered directly to customers for non-potable reuse, for seawater intrusion barriers, or to groundwater recharge basins for indirect potable reuse. An exception is when there is a contracted relationship between a producer and user of recycled water to use a natural watercourse as the method of conveyance to a downstream customer. There can often be post-disposal benefits resulting from release of recycled water into the environment. In some cases, agencies indicated that downstream users reused their water, or the groundwater basin was recharged by the stream or disposal ponds. Because these beneficial uses were incidental after the discharge or disposal of the effluent, they were not included in the survey, although it is acknowledged that there may be indirect benefits. The survey results were correlated with water recycling data submitted in the 2015 Urban Water Management Plan Update (UWMP). Correlating two independent data sources provides a high level of confidence in the completeness and accuracy of the data. The results of the survey are summarized in Tables 1 and 2 and Figure 1. Because of the complexity in how recycled water is produced and distributed in California, it was not always straightforward to list one agency for each connected system. Recycled water systems often involve more than one agency serving different roles of treatment, distribution, retail sales, or geographic service areas. For example, in many instances, a wastewater agency will produce the recycled water, but a water agency will distribute and retail the water. In other cases, a wastewater agency will produce the recycled water then provide it to a wholesaler, which in turn provides that recycled water to one or more retail agencies who distributes and sells the recycled water to its customers. Finally, in other cases, multiple agencies jointly participate in the treatment and/or distribution of recycled water. The retail agency that distributes the recycled water is generally the named agency listed in Table 3, except in the Los Angeles area4. The distribution of recycled water use by county is shown in Table 4. As the figure indicates, almost all counties in the state are recycling water to some degree. An increase in recycled water use in the Santa Ana, Los Angeles, and San Diego regions as a percentage of the overall state recycled use (see Figure 3). The distribution of beneficial uses of recycled water varies throughout the state. The Central Valley' primary beneficial use of recycled water is agricultural irrigation. Urban regions of the state have a greater diversity of beneficial uses with their regions. An increase in complexity of recycled water interagency relationships. Cooperative solutions to access and distribute recycled water to areas of higher demand. 1An acre-foot is the amount of water needed to cover one acre to a depth of one foot. It is equivalent to 325,853 gallons. 2The California regulations (California Code of Regulations, Title 22, §60301-60355) that contain the criteria for the levels of treatment and the appropriate uses for recycled water. The regulations cover secondary, tertiary, and advanced treatment levels. 3Recycled water that meets either the 2.2 or 23 coliform per 100 milliliters bacteriological results, as specified in California Water Code §60301.220 and §60301.225. 4Recycled water generated originally by County Sanitation Districts of Los Angeles County and the City of Los Angeles is grouped under those two agencies. The footnotes in Table 1 identify the recycled water wholesalers and retailers included within each organization’s total. For Water Replenishment District (WRD), which received recycled water originating from both organizations, the actual amount WRD reported to have received from each is included in the applicable organization’s total.